We’ve tried a lot of Passion Vines and to be honest the majority of hardy varieties are just basically a variation on that old house eating vine ‘Blue Crown Passion’ Vine (Passaflora caeulea). This guy is a surprise though. While it can freeze to the ground below about 20ºF it is evergreen in the majority of normal winters and its an early and heavy blooming vine- that is pretty as well. 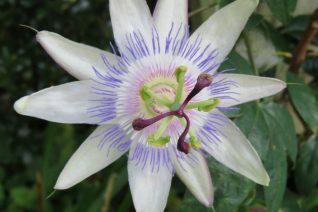 The white sepals surround a row of light purple filaments. Very delicate and intricate flower that we adore. Plant in a hot sunny aspect with support for its little tough twiners to adhere. And they will as the whole plant rises to 12′ tall in a single season. Blooms on new growth- as its growing it is constantly blooming. Loved my hummers, butterflies, pollinators in general. Mulch the base going into the first winter. Once it is established no arctic blast will affect the roots. Fast re-growth in in spring. Rich, well drained soil with regular summer water to speed growth. Flowers are approximately 4″ wide and very showy. Not a vine for cool shady gardens or arctic cold spaces.